This chart covers the week commencing April 1st to April 7th. Fortnite is still on top for another week, racking up over 33.8 million hours watched in the last week. The battle royale is once again keeping clear of any competition. League of Legends is in second, amassing over 29.5 million hours watched over the past 7 days. Grand Theft Auto: V remains in third as its popularity on Twitch continues. CS: GO takes fourth after a sizeable 41.6 per cent increase in views; Valve's FPS drummed up over 10.9 million hours watched last week. It's closely followed by PUBG Mobile, which racked up over 10.2 million hours watched. Apex Legends sits in sixth place after a 12.3 per cent decrease in views, the first drop on the board this week. It seems a lot of the creators holding up Apex's numbers have returned to other games. 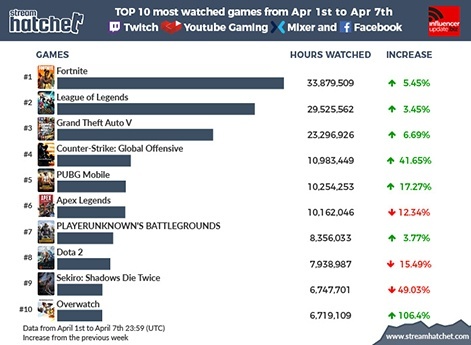 PUBG is in seventh, a 3.7 per cent increase in views sees the battle royale move up one spot. Dota 2 falls to eighth after losing another 15.4 per cent in hours watched. Sekiro: Shadows Die Twice drops by a huge 49 per cent, racking up 6.7 million hours watched in the last week. 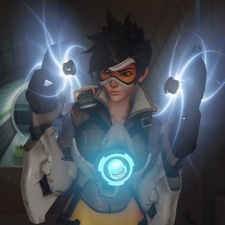 Lastly, Overwatch is back on the board in tenth after a massive 106.4 per cent increase in hours watched.